I haven’t been very good about posting updates on my 101 list, although I have been good about accomplishing the tasks. 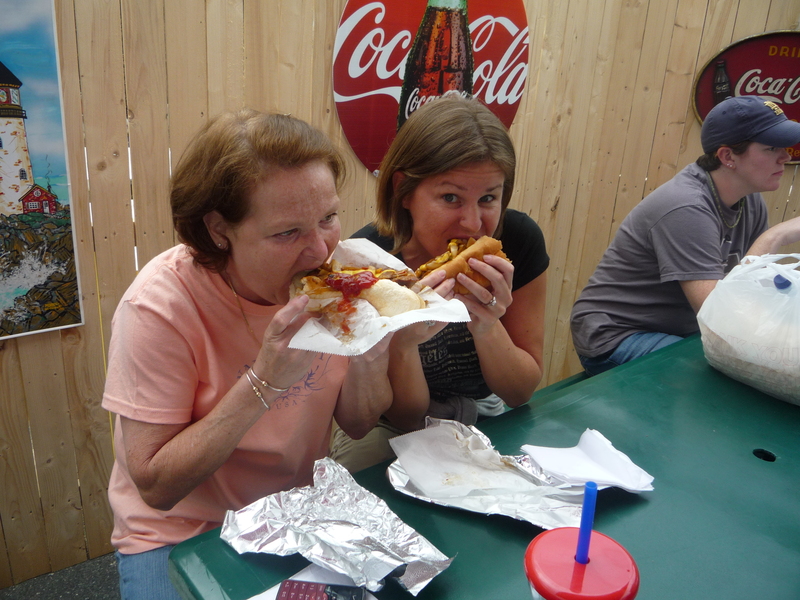 Back in September, I completed one of the tasks I was looking most forward to: #11- Go to the Big E! 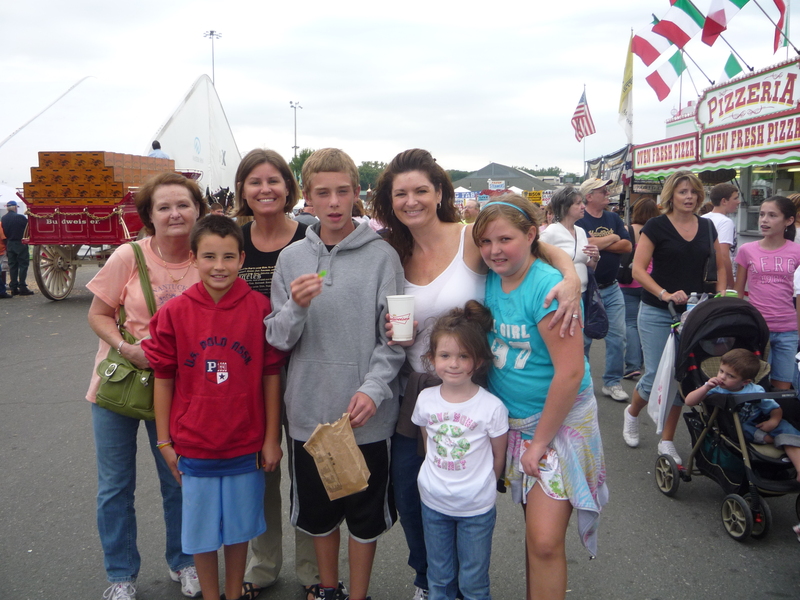 I grabbed the “in-laws” and the nieces and nephew, and we were off to a day of delicious fair food. 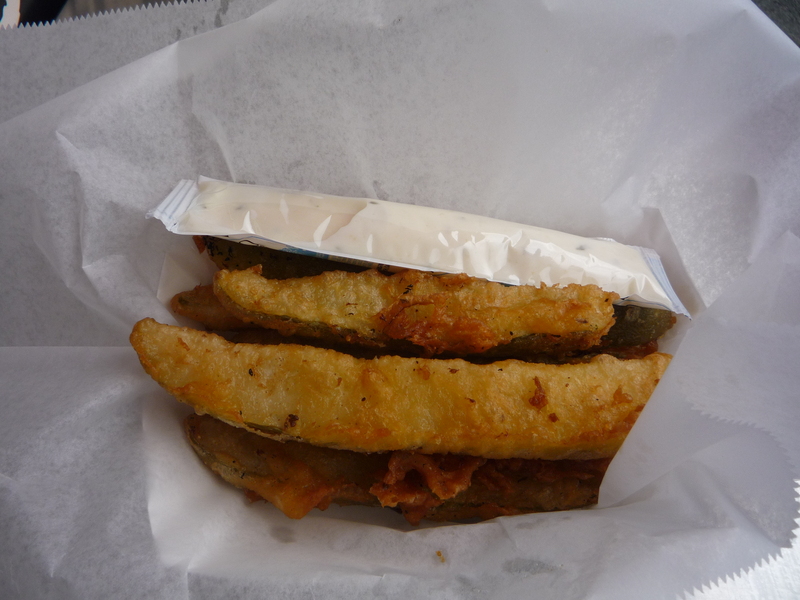 First up on the hit list was something I have been dying to try for ages…fried pickles! No one else was as excited about these as I was so I ended up eating most of them myself. This was probably my first big mistake. I should have known better – only a couple of bites so you have room for everything else! But, they were delicious. Crispy on the outside, and tender inside. The only flaw was the very standard “packet” of ranch on the side. 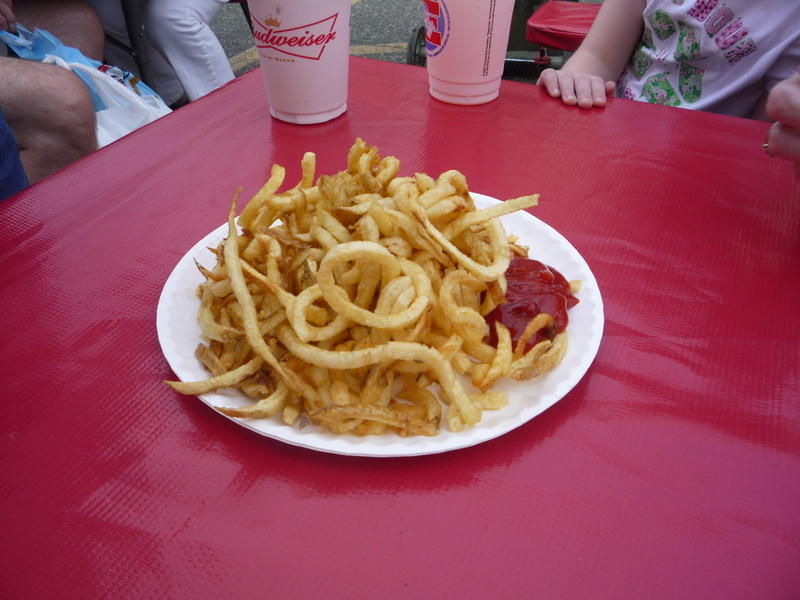 Mistake #2: Plain curly fries. I know, I know. Why would you waste valuable stomach room on french fries that weren’t slathered in cheese, or vinegar, or chili, or chocolate, or whatever fairs slather fries in. Well the truth is that these were really for our 5-year-old niece, I just ended up eating most of them. But never fear, we were washing it all down with nice, dishwatery bud lights, so it was all good. 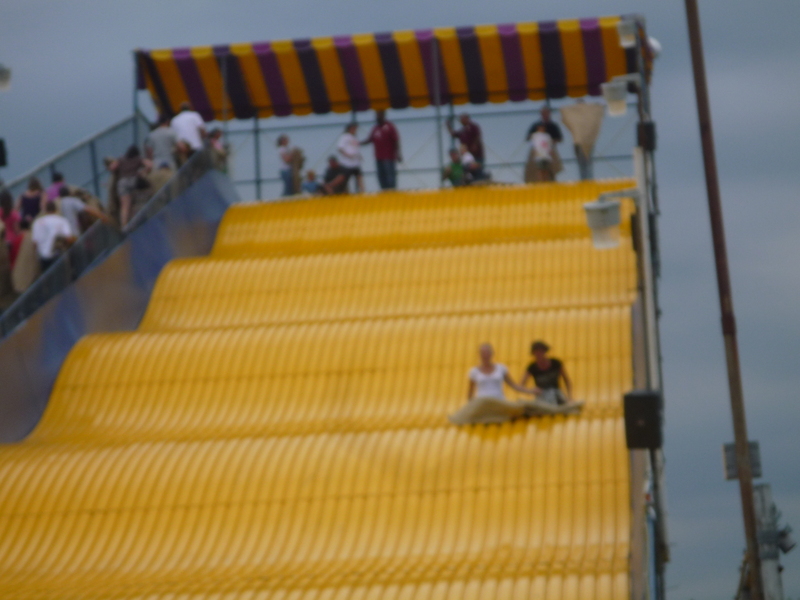 It was then time for a super slide interlude… The rest of the gang indulged in traditional fair sausages with onions and peppers at this point. This is where I made my 3rd mistake. I decided to wait for something “more exotic”. Meanwhile their sausage was one of the best I had ever tasted. I spent the next 2 hours not able to find anything that sounded good to me, and eventually settling for sub-par “movie” nachos because I was getting to angry hungry. And NOBODY wants me to get to angry hungry,. Time to hit the rides! Since our days of riding the Gravitron are over, the over 30 crowd sat back while the nieces abused every fun house they could find. 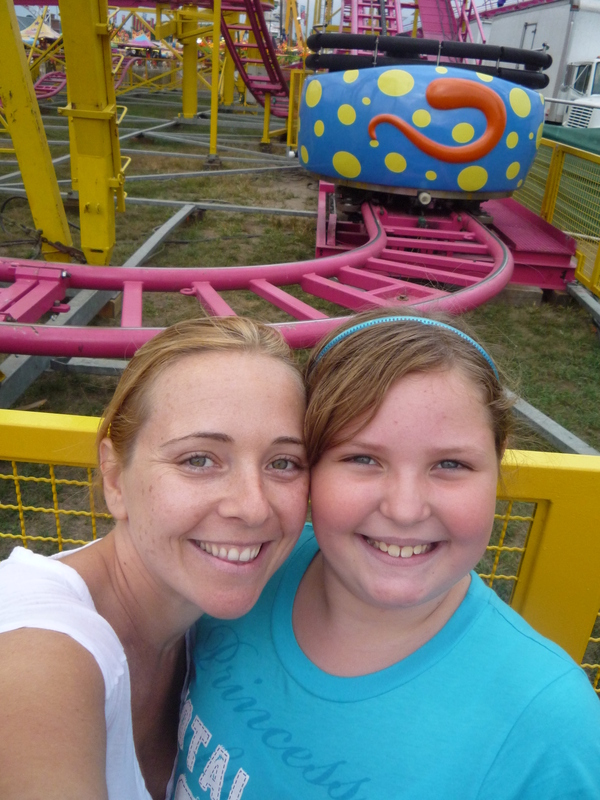 Then I did my “aunt-ly” duty and took Em on the “Super Mouse Rollercoaster”. Her face on the way up was priceless as we climbed to a great view of the park, sheer fear. Unfortunately we whipped around a corner at full speed before I could get a good picture of it. At the end of the ride I had a super smiley Em, ready to do it all over again. Stop the presses! There are turkey legs at the Big E! Stop the presses again…THEY CHARGE $9 FOR ONE TURKEY LEG!! Are you kidding me? Is it from a golden goose?! Completely ridiculous, yet still consumed by us. At least we can feel better that we split the royal leg 5 ways…but it wasn’t even that good. The crescendo of the Big E is the Maine Baked Potato in the Maine State House. 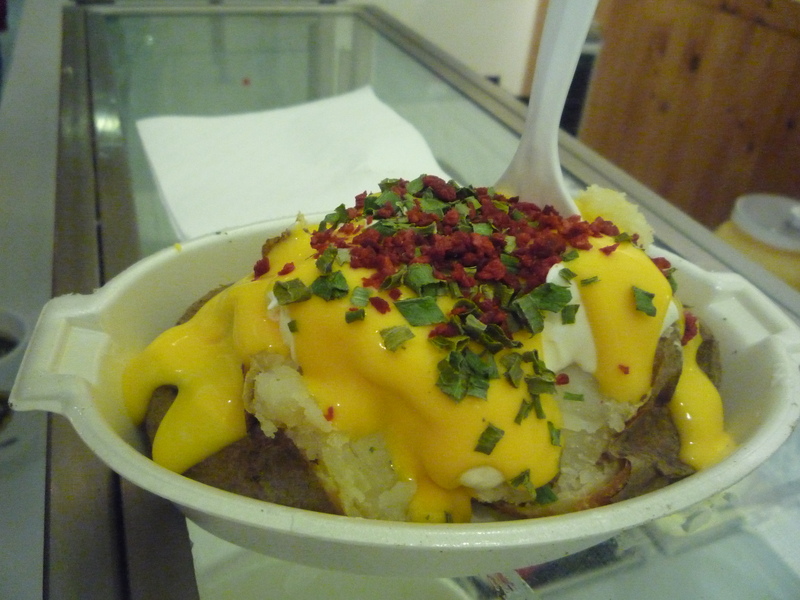 Apparently this baked potato is something close to world famous. The legends of the line, just to get one potato, strikes fear in the hearts of the weak. However, we walked right in, right to the counter, and right to eating. Eh. It was a potato. It had canned cheese, bacon bits, chives and sour cream. I like baked potatoes as much as the next gal, but…eh…. So there you have it. 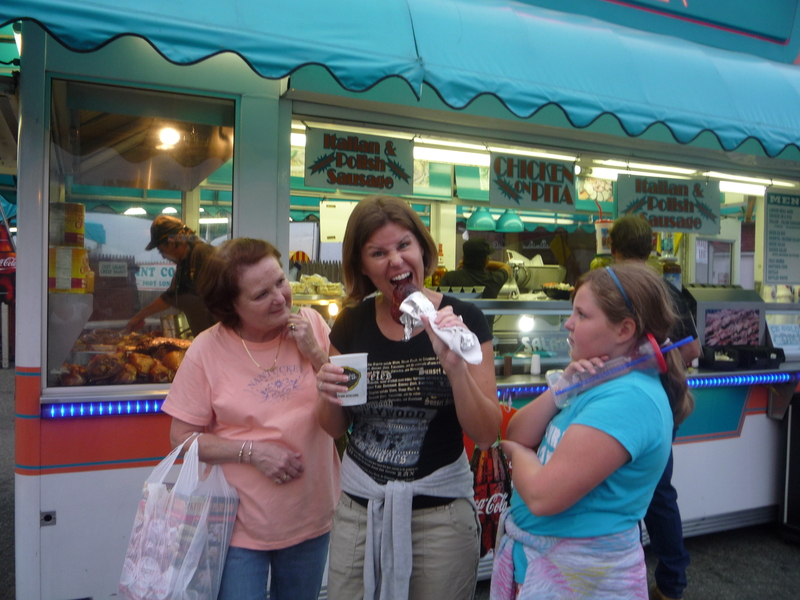 A food journey through the Big E. Nothing was shocking. Nothing was amazing. I didn’t try fried butter or a donut burger. Luckily enough though, this fair comes back every year! This entry was posted in 101 Blog, Reviews and tagged big e, fair, family, family vacation, fried pickles, main baked potato, maine state house, massachusetts, rides, springfield, state fair, turkey leg by reneeh. Bookmark the permalink. 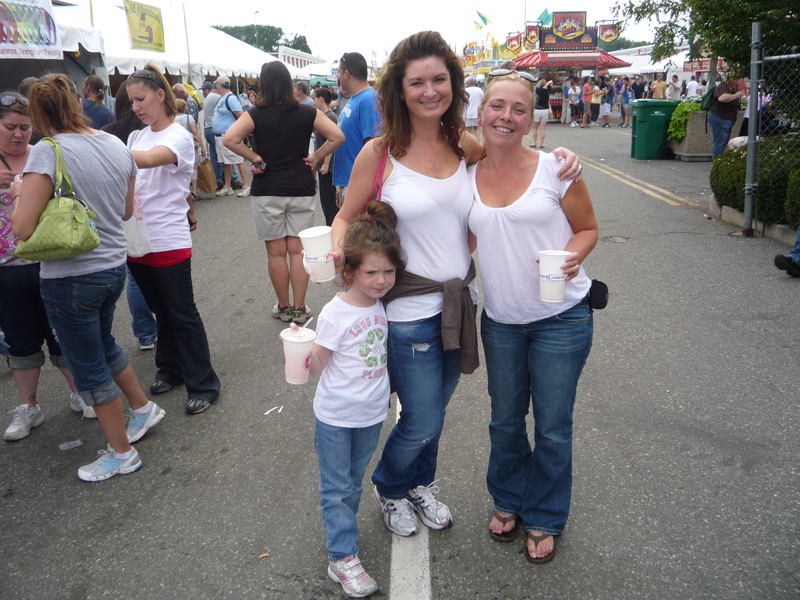 Hi Moms- The Big E is just like the Florida State Fair! 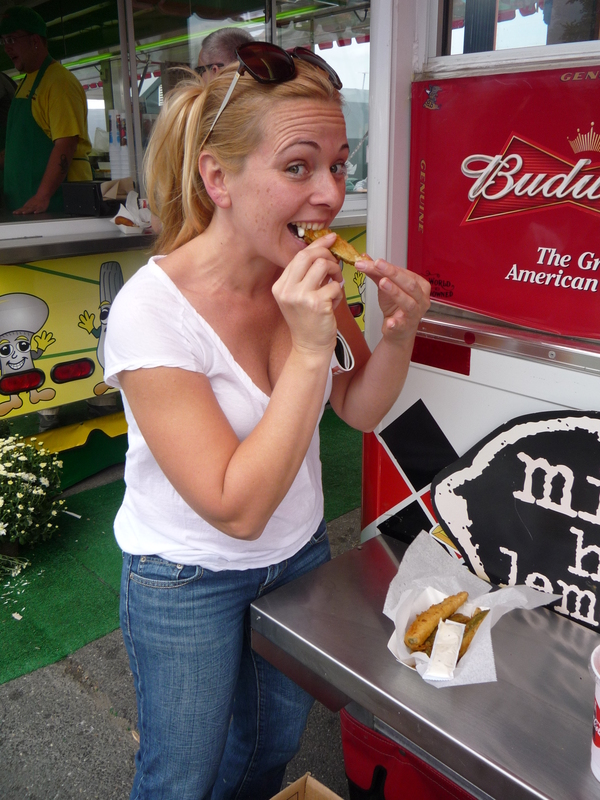 I have never been to the Big E but if I were there, I would have split some fried pickles with you! Aw! Thanks Michelle! I think next year we should plan a foodie trip to the fair so there are plenty of people to split all of the over-priced over-fatted delcious treats with! That turkey leg looks really funny! I have never been to the Big E, but it is definitely on my list of things to do! I’ve never had fried pickles! If I were there, I’ll probably go for the sausage. Big E seems like a fun trip! I loved the big E when I was a kid. The apple fritters in the massachusetts building are good! and the VT maple candy.